In the bustle of our everyday lives, it's easy to be distracted by negativity and materialistic impulses. We forget that happiness and freedom are a state of mind and not an objective to be achieved. Based on the principles of Buddhism, WISDOM OF THE BUDDHA MINDFULNESS DECK reminds us that contentment, comfort and joy are within our reach in every moment. 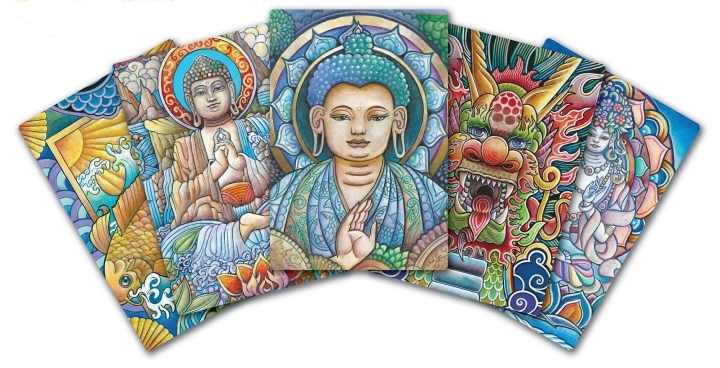 Each card features an inspirational Buddhist quote and the vibrant and unique artwork of Matthew Smith. The accompanying guidebook offers deeper meditations inspired by Buddhist texts to help you attain the mindfulness you seek.